Depression engulfed Michael's world and forced him into a black hole. He quit prescriptions cold turkey and replaced the medication with workout-induced endorphins! I'm 53 years old and have been active for most of my life. I retired from the U.S. Army as a chief warrant officer after serving for 21 years. Upon retirement, I was sworn into a fairly large police department outside Washington D.C. in northern Virginia. I'm currently semi-retired and living in the East Valley of Phoenix, Arizona. My wife, Holly Hawkins, and I are proud parents of seven children and have four grandchildren. I want to set an example for my family to live a healthy, fit, lean, and strong lifestyle. I have suffered from depression for many years, which contributed to my resignation from public service in 2005. After leaving public service, my downward mental health spiral continued. It was like living in a black hole. As a result, I focused less on the gym and my physical health. It got to a point where the scale topped at 220 pounds. Although I was still going to the gym on occasion, I wasn't happy with my body. The number of anti-depressants and other medications I was on increased and I became uninspired and lethargic. I looked in the mirror and thought, Enough is enough! In July 2009, I quit all anti-depressants cold turkey, which isn't recommended, and hit the gym with a vengeance. After several weeks, my workout-induced endorphins took the place of the calm I received from prescription medications. The problem was I failed to tie in my nutrition with my workouts. Although I was getting stronger and leaner, I still didn't have the physique I was working for and capable of obtaining. 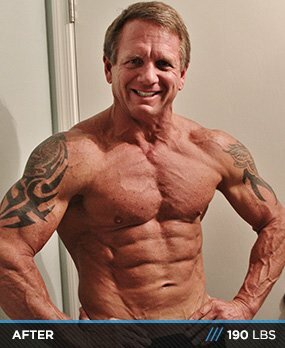 In December 2011, I made a resolution to achieve a physique that would set me apart from most people my age with a dream to compete in a physique show. I consulted an online trainer and cover model, Melih F. Cologlu, and my journey began. Within a few weeks, I started seeing my abdominal muscles for the first time. By training smart and understanding nutrition's role in the transformation process, I currently possess a physique I'm proud of. This is a lifelong journey with no end. My depression is in check and I have never felt healthier. My subsequent annual physical confirms my feelings. Living healthy, fit, lean and strong is the only way. Initially, I picked up where I left off. I have a tendency to be a cardio addict and started every workout with 45-60 minutes on the elliptical and spent an hour lifting weights. I didn't have a clear-cut workout plan and trained a different body part every day. One day, my order from Bodybuilding.com arrived with Body By Design by Kris Gethin. I read the book and felt newfound motivation to accomplish my goals to get healthy, fit, lean, and strong. I varied my workouts and intensity, and adjusted my cardio programs based on the information and workouts provided. I got a better understanding of nutrition and how it affects my workouts. In December 2011, after working out for a solid year and still not enjoying the results of my hard work, I decided it was time to consult a professional. After weeks of research, I hired online trainer Melih F. Cologlu. Under the guidance of Melih, I started understanding the importance of nutrition. Throughout 2012, I learned to treat food as fuel for my workouts. Another mistake I made was a lack of intensity. I always thought I was pushing it. Melih's workouts were designed to transform my physique and the results showed. I also learned to cut back on cardio and use HIIT. Additionally, I learned that time spent doing thousands of crunches in the past could've been spent elsewhere. I have a new respect and understanding for proper abdominal training and nutrition to achieve the ripped mid-section I strived for. I train using a 10-day cycle. My first five days are high volume and the second five are power days. My biggest problem was nutrition. At first, it was hard to consume all the food planned for the day. 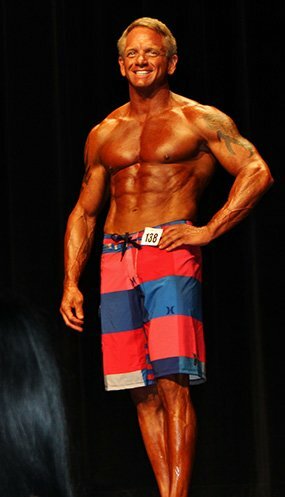 I entered my first physique contest in November 2012 at the NPC Western Regionals. I didn't place. However, just stepping onstage was a major accomplishment. I plan to compete again next July and November and will present an even more fit/lean package. This isn't about reaching a goal; it's a lifestyle that enhanced my quality of life. No one can want this for you; you have to want it. The phrase "No one said it would be easy" is absolutely correct! You have to reach far outside your comfort zone and go after your dream. 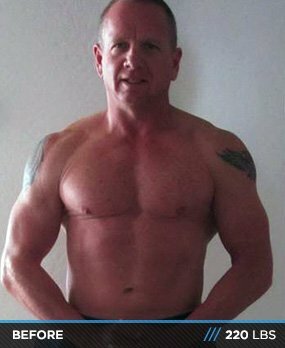 I did this transformation at 53 with proper nutrition and training. There are many resources out there. Bodybuilding.com is an excellent choice. Many people on BodySpace post their workouts. Body by Design is a great book because it outlines many people who have overcome obstacles. After training and deciding I wanted to compete, I found a trainer who could bring me to those goals. Receiving the surprise book by Kris Gethin early on in one of my orders was amazing. I also think BodySpace is a fantastic tool for everyone. Bodybuilding.com's affordable supplements always arrive in a timely manner. No other online supplier matches the speed and accuracy of orders I make with Bodybuilding.com.